Cholesterol: such a vital component to health yet a pretty difficult thing to fully comprehend. There’s quite a bit of misunderstanding surrounding cholesterol so it often makes it a challenge to understand. Here’s how I like to think of it that makes it a bit easier: cholesterol molecules are like handymen in Venice. 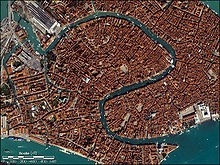 Think of Venice and all of its canals as the blood stream. Each home in the city is a cell in the body, each business in the city is a gland/organ. All these places have maintenance, cleaning and improvement needs. They have their own in-house workers for the little work but if the job is too big or resources are too scarce, extra help is needed and the city kicks in to help. Cholesterol molecules are the handymen that are called for whatever job is needed throughout the city (cell membranes, bile production, hormones, neural connections, inflamed tissue repair). Lipoproteins like LDL and HDL are the boats that take cholesterol handymen around the city. LDLs are boats that deliver handymen and their materials to work. HDLs are boats that pick up handymen, take them back home, take them to an LDL for transport to a new job or take them to a local business for some work (glands & hormones). When the city has a lot of repair work, the Department of Maintenance (liver) sends out more handymen. If the jobs are small and typical each LDL boat can carry a bunch of handymen and the canals stay pretty empty. If there are lots of jobs or big jobs with lots of materials needed, each LDL only carries a few handymen so there ends up being a lot of boats crowding the river. Either way, there often the same amount of handymen, but a much different crowd in the canals. **Takeaway #1: The number of handymen in a canal or two at one time (your total cholesterol) is different than the number of boats (lipoprotein particle count, this is rarely measured). Cholesterol count doesn’t correlate with crowded canals, the amount of boats does. You need to find out how many boats are in your canals. Sometimes if there’s a small fire or repair needed along the canals (damage in artery) the boats drop off handymen to deal with it. This is a pretty regular occurrence as handymen quickly fix these cracks and then move along. If the damage is big or the fire keeps burning, more and more handymen get dropped off to fix it. Too many handymen trying to fix damage in a building will start to block the canal. If it gets out of hand the emergency crews come in and that really bogs down the canal. The problem isn’t the handymen, it is the big or recurring damage. **Takeaway #2: Measuring the cholesterol in boats in a part of the blood doesn’t tell us if any cholesterol is repairing your arteries. You can have lots of handymen traveling to jobs throughout the city but very few or none repairing canal damage or you can have the opposite, few workers in boats because they’re all working on damaged arteries. This is why half of all heart attacks occur in people with “normal” cholesterol. If you have high cholesterol (lots of handymen out and about) then you know 1 of 2 things. Your body is shutting the doors on the handymen and not letting them in to do their job. The solution is not to fire handymen. Sorry statins. Why are you in need of lots of handymen? Are you inflamed (lots of damage)? What are you doing to cause your body to produce cholesterol? Why is your body not letting the handymen in? Is your thyroid down regulating the body’s system (ignoring the handymen)? Why is your body slowing down? **Takeaway #3: Don’t blame the cholesterol. Find out why you’re making so much or why it’s not being let into the cells. Often overlooked but very important is the quality of water (blood) the boats are traveling in. Toxic or dirty water will pollute and destroy both the sides of the canals (arteries) and the boats (ie LDLs). Blood full of sugar, oxidative molecules and chemicals is toxic, corrosive and infiltrates arterial walls and lipoproteins. If boats are out too long in toxic water without going back to get cleaned they get dirty and rust. Same with LDLs. If a boat/lipoprotein degrades to the point of breaking or leaking and sinks or moves off to the edge of the canal, other boats come to help fix it, resulting in traffic jams. If the water erodes the canals, Venice sends handymen to patch up the damage. My common sense tells me that this has something to do with why our body makes cholesterol and uses LDLs to deliver the cholesterol to the damaged artery to patch things up. Think scabs on a scrape on your arm. Our body patches the wound until it heals and then the scab falls off. Could this be the same process we see in arteries? Keep bothering that scab and soon a scar develops. Let it heal and often the skin is as good as new. Something to contemplate when we start blaming cholesterol for plaques in arterial walls. Is it the scab’s fault you cut your arm or is that your body’s way of fixing the damage? Blame the knife, not the components of the scab. Keep cutting your arm? Blame yourself for not changing your behavior, don’t try to stop your body from making scabs. **Takeaway #4: Bad quality blood degrades arteries and blood cargo and may have much to do with why cholesterol is high. For boats and lipoproteins alike, when it comes to their construction, quality matters. Boats made with low quality wood or without a protective coating will certainly corrode quickly. Simalarly, lipoproteins (made of fats and protein) with low quality construction will oxidize more easily and, in essence, break down in the bloodstream. The quality of the fatty acid part of the lipoproteins is the concern, as highly reactive and sensitive polyunsaturated fatty acids (think vegetable oil, seed oils) are the low quality equivalent of bad wood. The second consideration is the boat’s finishing: the protective coating that protects the boat’s exterior from wear and water damage. A boat (even made from low quality wood) with a great resilient paint job can withstand floating around a long time, even in toxic water. In lipoproteins this exists as an antioxidant barrier and it helps protect the particle from oxidation while traveling through the bloodstream. A lipoprotein without sufficient antioxidant protection is akin to a boat not coated in water and rust protectant. It will simply get worn out faster than it should, particularly if the wood is low quality. **Takeaway #5: Quality matters in both construction and finishing. Having strong composition (low concentrations of polyunsaturated fatty acids) and finish (high levels of antioxidants) helps particles be very resilient, even in toxic blood. One of the biggest risk factors in heart disease appears to be stress and the often related high blood pressure. When we get stressed our heart rate elevates and blood starts pumping through our arteries more quickly and powerfully. Although a great adaptation for occasional stressors, this dynamic is trouble when it happens too often. Think of all these handymen floating around in their boats, doing their jobs, drifting along in the nice easy current of the canals. Then imagine a big storm in the city and the head of the state makes the call for action of all handymen “Go, go, go! And get there quick!” Just like that all the oars start pumping and the water current starts flowing faster, waves starting to crash against the sides of canals and buildings as all the boats rage to their destination to help with the prepare and repair damages. One storm every once in a while isn’t a big deal and is good for them to stay sharp but if that current is always raging from all the stressed out handymen paddling furiously to get somewhere, those canal walls start to wear down from the water crashing into them and rushing past. Not to mention the beating that the boats that the handymen ride along in take. The whole system wears down much faster if the current is always running quickly. Our blood vessels are not much different. Constant elevations of stress and the subsequent raise in blood pressure and force of blood rushing through our arteries takes its toll and erodes the lining, often causing damage that needs to be repaired by cholesterol and lipoproteins. Then consider if your blood is toxic and always raging hard, putting extra pressure on both the walls and the lipoproteins. This is why stress is considered such a risk factor for heart disease- it puts our system under so much pressure that we both are at risk for big breaks but we also generally wear down everything much faster. Takeaway #6: How quickly and with how much force your blood moves through your vessels matters. The more frequently we call the stress response and amp up the current the more damage we are likely to create. This analogy could go on pretty extensively but I hope the simple points were made. Think about cholesterol as an important substance and part of the body’s function. We need those handymen and delivery boats. The body has good reasons for how many workers and boats are in the bloodstream. If you’re concerned about it, check how many boats your body needs to deliver its handymen (LDL and HDL particle count). If your cholesterol is low but your boats are high, you’re at risk of crowded canals. If your cholesterol is high but your boats are low you may not be at as much of a risk as we once thought. Best idea: look into the WHY of the matter, particularly the quality of your blood. Hint: it’s not that you’re eating too much cholesterol or fat and might be the exact opposite. Want more detail and some expert opinions and discussion? I put together a pretty extensive review on cholesterol that was a bit too long for this blog post, so I put it onto a separate page. For those of you interested in more, check out my monster compilation on cholesterol here… Cholesterol: Extended Coverage. Thanks for reading (particularly if you read the extended coverage), have a great week! Very interesting thoughts. I always thought that LDL and HDL are same as cholestrol/handymen. You are suggesting LDL is the boat carrying them. Then what exactly is cholestrol – all three including triglycerides as you suggest but how ? Yes- both HDL and LDL, along with IDL and chylomicrons, are transport vessels for cholesterol particles, triglycerides and vitamins/minerals. Cholesterol itself is a substance that serves a number of purposes (many of which we are still discovering) that appear to be independent of the lipoprotein that delivers them and the triglycerides and nutrients that ride along with them. Just as a boat can deliver different workers, it can also carry different goods and equipment, just as LDLs carry cholesterol (handymen) as wells goods (triglycerides) and equipment (vitamins/minerals). Therefore LDLs (along with all the different lipoproteins) are multifunctional but because they are transporting multiple things. Cholesterol is one of the main components of an LDL but the primary passengers seem to be the triglycerides. All of this is still far from absolutely known however. Does that answer your question?